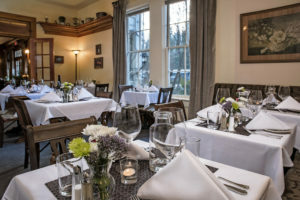 From intimate dinners in Sage to casual gatherings in the Axe & Rose Pub, the McCloud Hotel offers an unforgettable culinary experience from beginning to end. 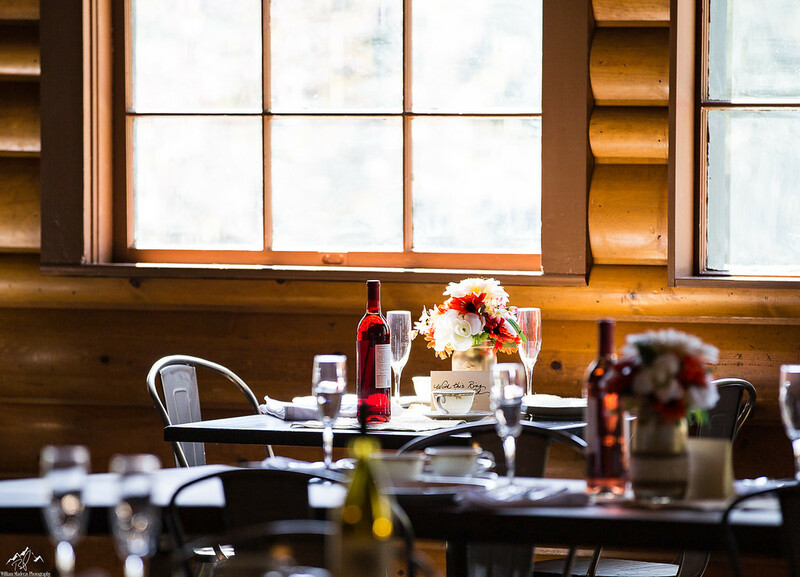 Coupled with its illustrious history and picturesque setting, dining at the McCloud Hotel blends all the necessary elements and more, for a gathering to be remembered. Relaxed fine dining for elevated American comfort fare. The imaginative menu infuses California, French and Mediterranean influences and changes with the season. Dishes include vegetables and herbs from the hotel garden in addition to locally sourced grass-fed beef, eco-sustainable fish, vegetarian, gluten-free and vegan options, many of which are organic and direct from small growers and farmers. The extensive wine list has been hand selected to compliment the cuisine. The romantic Sage dining room is located off of the hotel lobby. Arts and Crafts Mission Style framed prints by Chico artist Dave Simcox adorn the walls. Outdoor dining under a pergola-covered terrace overlooking the gardens during the summer months or when weather permits. Sage Restaurant is available for private events and catering. Open to the public year round Wednesday through Sunday evenings with seating’s from 5:30 to 8 PM. Walk-ins welcome. Dining space is limited, so reservations are encouraged, especially in the summer. Hours: 5:30-8P.M. 7 nights, Memorial Day – Labor Day and Wednesday – Sunday evenings throughout the rest of the year. Relaxed yet refined, Axe & Rose Public House, is a cozy space with a full bar. Like Sage, the Pub continues a commitment to environmental stewardship with locally sourced, organic or sustainable items whenever possible. 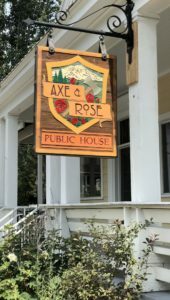 The Axe & Rose Public House offers a unique Mt Shasta dining experience, full bar and traditional pub style menu. Once the workforce cafeteria for the old lumber mill and later a dance hall the building provides craftsmanship and details largely preserved in its original condition from the 1930’s. The atmosphere is casual neighborhood gathering spot meets retro speakeasy. But the fare demonstrates a refreshing lack of pretension: its simple food done very well. 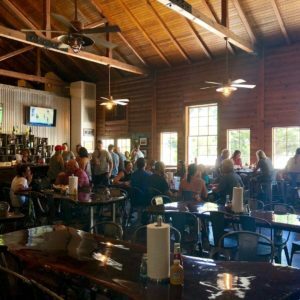 Wild Mushroom Flatbread, Bison Burger, Banh Mi Sandwich, Hanger Steak and beer-battered Fish & Chips along with homemade pies are just some of the standouts. Custom-made walnut live-edge tables, corrugated steel and wooden crate back bar with three big screen TV’s is warm and welcoming. Wi-fi is excellent. Just 5 miles from the Ski Park and Nordic Center, the Axe & Rose has a laid back and relaxed mountain atmosphere that makes it the perfect location to meetup with friends after a day on the slopes. 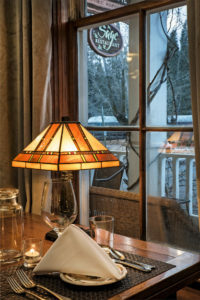 Open 11:30am daily, enjoy a casual lunch, fun dinner with a group or romantic dinner for two.